Bristol Anxiety Clinic runs alongside other PerformWell services and specialises in rapid recovery from anxiety panic attacks conditions for professionals and executives in business, sport and media. We provide a results orientated service and where appropriate offer guaranteed outcomes. Bristol Anxiety Clinic is run by Paul Burden, Performance Coach and Director at PerformWell. He offers extensive experience of providing rapid recovery from anxiety and stress related disorders, including extreme examples such as military personnel with anxiety panic attacks related to post traumatic stress disorder. Why Do I Suffer From Anxiety Panic Attacks? Anxiety is a normal human response to a stress situation and serves to prompt the person to cope in difficult circumstances. The intensity of anxiety becomes a problem when it is inappropriate or unwarranted, or the action needed to stop the anxiety before it escalates is not known. 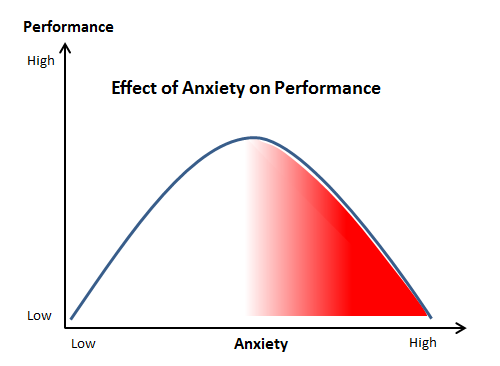 Studies show that beyond a certain point anxiety has a drastic effect on personal performance. Where are you on this curve? The symptoms of anxiety panic attacks can severely impair enjoyment and performance and it’s likely that your relationships and even health may be suffering. Panic attacks are usually brought on by a specific neurological trigger. These triggers cause a neurological pattern to run, which feeds back on itself causing the feeling of anxiety to rapidly escalate into panic. The trigger is usually very specific to the individual. Excessive exposure to intense anxiety can lead to a General Anxiety Disorder, where unwarranted and sometimes intense anxiety is brought on by what would otherwise be normal every day events. That means it’s important to avoid over thinking and find an effective way to overcome your anxiety panic attacks quickly. And so instead of asking ‘why’, the more important question is how do I overcome my anxiety and panic attacks NOW? So How do I Overcome Anxiety Panic Attacks? If you’re looking to put a stop to your anxiety panic attacks once and for all then click here now for information on specialist treatment for anxiety and anxiety disorders.